MIA. Nah. Just slack. I have had no motivation to do anything. Especially scrapbook. So, nothing to share on this post. Except for a new baby. My niece arrived yesterday surprising us all as Fliss, my sister, was booked in for her caesar today. 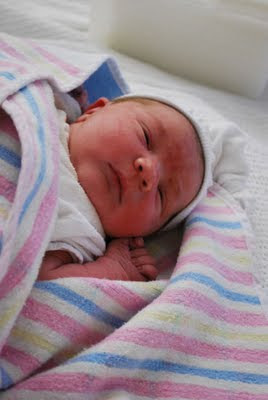 She was born at 9.27am, weighing 3260g, 50cm long with HC of 33.5cms. Congratulations Aunty Beth, Erica Nicole is beautiful. Congrats on the birth of your niece Beth! How special! What a sweetie! She's beautiful. Congrats on the arrival of your new niece.